Create festive accessories by filling decorative bowls with pinecones, holiday greenery, seasonal fruit, or Christmas balls. Give your home an instant boost by touching up the paint on your walls, trim, and baseboards. Purchase pretty napkins or a handsome new serving dish to make store-bought holiday goodies look elegant for your guests. Sometime between Christmas and New Year’s, grab a cup of tea and notepad and settle into a favorite chair. 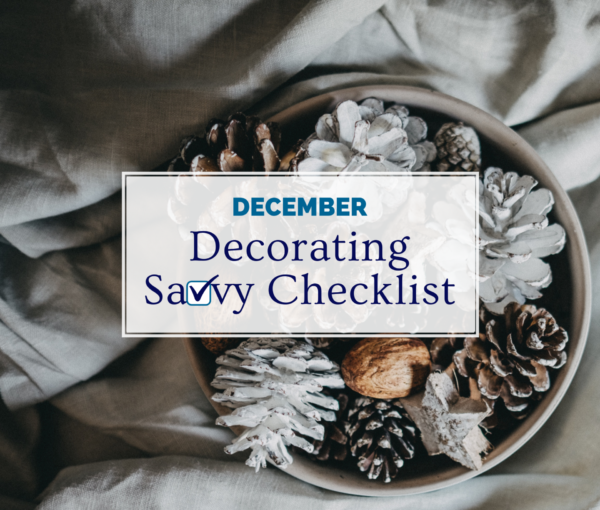 Contemplate which room or rooms are on your list for a redo, refresh, or total overhaul for 2019. Set a budget and a start date. Schedule a time to reflect on and bless your home just as it looks today! It’s been a full year of Pinterest pinning, HGTV watching, and blog and magazine reading. Inspiration images do inspire, but they can also make us lose sight of all that IS working in our homes, starting with the gift of having a roof over our heads and a warm bed in which to sleep. So, this month, say a prayer of thanks and open your eyes to appreciate the beauty that is your home. Then, say a prayer for those in need. Maybe send a check to a homeless shelter or food pantry. Wishing you a beautiful and blessed Christmas, Hanukkah, Kwanza … and 2019!